My favourite book growing up was The Secret Garden, by Frances Hodgson Burnett, all about a little girl, Mary Lennox, forced to move to her uncle’s house after her parents died. While there, she discovers a walled garden which has been locked and left untended since her aunt died in it many years earlier. I won’t spoil the book for you by telling you what happens, but it used to have me in tears. I longed for my own secret garden where I could play and work miracles, but of course, it was a story. I could imagine how it would look as there are two walled gardens near Helensburgh which I used to visit: Geilston and Ardardan, but they are both very well looked after. The first Sunday of the month is a good day to go as there is a guided tour from the main car park, and as it was such awful weather, I had the tour to myself. 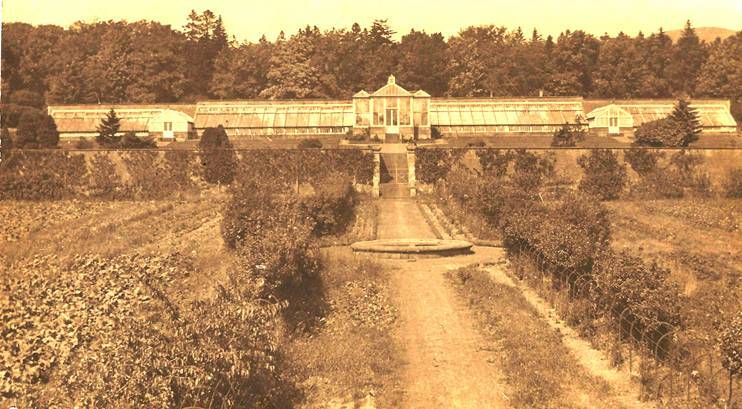 The Garden used to belong to the Penicuik House Estate and was used to grow all the fruit and vegetables not just for the big house, but also for markets in Edinburgh and London. The wall kept it sheltered from the winds and huge greenhouses built against brick walls meant that they were able to grow exotic fruit like pineapple, figs, grapes and peaches. Can you believe that? Pineapples growing in Scotland? Apparently the bricks soak up the heat and if the fruit is grown against the wall it thinks it’s in the Mediterranean. Over the years the Estate started to fall apart and the Garden became more and more neglected, which is incredibly sad. It must have been amazing to see when it was being looked after. Mr Kelly, my guide for the day, has very kindly allowed me to show you some of his photos to give you an idea of how it was. In the 1970s the main part of the Garden was used for planting Christmas trees which grew fast and could be quickly turned into charcoal, but even that was abandoned eventually and the once beautiful garden was forgotten about and the weeds were allowed to take over – the garden was lost. However, about ten years ago it was found again by the Penicuik Community Development Trust who are now working very hard to rescue it and turn it back into a proper kitchen garden again. It didn’t look very much like a kitchen garden on the day I visited but you can see all the beds where the greenhouses used to be and these are already being used for growing fruit and vegetables. There are no glass houses yet but there is a plastic-covered area which was a very welcome shelt andfrom the rain and snow! The day I went, there was a big bonfire going and the volunteers working that day had put some potatoes in to cook. We had those with butter and cheese and some freshly picked salad leaves from the plastic greenhouse. It was so tasty and a real treat to be allowed to pick my own salad where it was growing. You can’t get any fresher than that! I had a great time wandering around and exploring the hidden paths in amongst the Christmas trees pretending that I was Mary searching for the elusive Dickon and hoping that my Uncle wouldn’t discover that I had invaded his special place. In the derelict cottages and workshops at the back I could almost hear the chattering of the old gardeners and the sound of them sharpening their scythes on an old knife grinder. Even in the cold and wet, it was a magical place to be and one I plan to return to very soon. How exciting to be able to watch this very special Secret Garden develop and return to its former glory. The Lost Garden Tour leaves from the Carlops Road car park at 2.00 pm on the first Sunday of every month and is free. Details of when you can visit or help out in the Garden can be found here. This entry was posted in Places, Uncategorized and tagged Lost Garden, Lost Garden of Penicuik, Penicuik, Secret Garden, World Book Day. Bookmark the permalink.